MINIMAL BLEED FABRIC MARKERS - These Artworx permanent fabric markers are specifically designed for use on any fabrics and apparel. Suitable for all types of DIY arts and crafts or fashion projects, unleash your creativity! VIBRANT COLORS - Includes 12 richly pigmented bold and vibrant colors in each pack. DUAL TIPS: Broad and fine for precise highlighting and underlining. 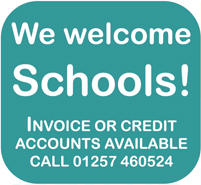 Allows you to write in both thin and thick lines, providing great versatility and flexibility. KIDS SAFE & NON TOXIC - No hazardous chemicals used. Not suitable for children under 3 years of age. Do you love expressing your creativity and creating great, vivid designs wherever you go? These fabric marker allows you to write in all kinds of styles on any kind of clothing - including, jeans, shoes, T-shirts, backpacks and purses, among others. It allows you to create your own bold, brightly colored designs on most fabrics. These high quality permanent markers are durable, long lasting and fade resistant. We've gone to great lengths to source the highest quality components for you, to make your artistic experience a moment of fun.. 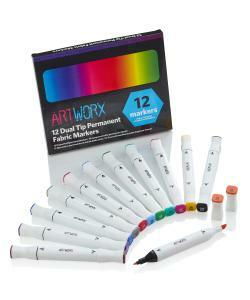 Fabric Markers will perform as promised, providing the instructions are followed. Always allow one color to dry before adding another to prevent any bleeding. As the name suggests, these are permanent markers, so please take care not to apply them to any surface you do not wish to be marked. It is recommended to always perform a patch test first on a hidden part of the garment, or on a piece of matching scrap fabric. The fabric may bleed during the first wash, hence to prevent bleeding, wash the garments separately for the first 2 washes in cold water.